In the wake of Charlottesville, race and the fates of the state’s many Confederate monuments were front and center during the second Virginia gubernatorial debate between Republican Ed Gillespie and Lt. Gov. Ralph Northam. MCLEAN, Va. — The second debate between the candidates running for Virginia governor was dominated by their plans to improve the state’s economy, but in the wake of Charlottesville, race and the fates of the state’s many Confederate monuments were also front and center. 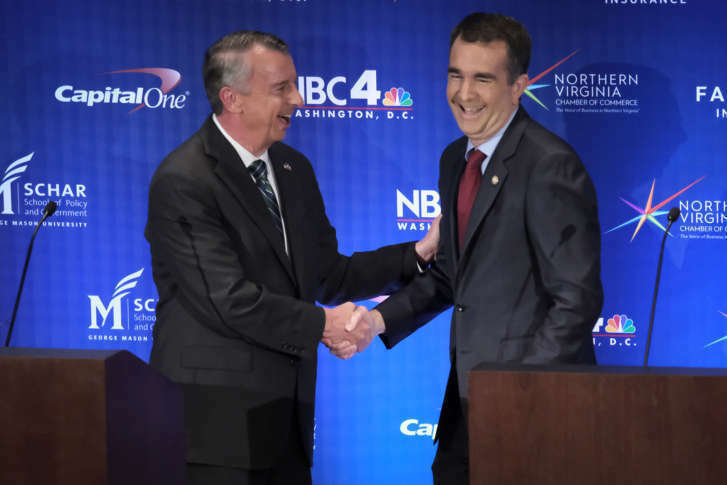 During a civil but energetic debate, Republican Ed Gillespie and Lt. Gov. Ralph Northam, a Democrat, saved their sharpest words for the white supremacists whose Aug. 12 rally turned deadly. The comments are similar to statements he’s made in the wake of the violent confrontation. Gillespie also reiterated his view that the statues erected in the decades after the Civil War should remain in place, but with proper historical context. He also called for more statues to celebrate newer civic leaders like former Gov. Doug Wilder, the first black governor elected in any state. Northam said such memorials allow groups like those who rallied in Charlottesville to “spew hatred and bigotry.” And although he would leave the decision to local communities to determine their future, he said he would prefer they would be relocated to museums. He said allowing communities to discuss what the statues and figures mean and what legacy they intended also gives the state a chance to breathe after last month’s violence. Both candidates were running a tight race in the run up to the second of three debates. The Northern Virginia Chamber of Commerce and the Schar School of Policy and Government at George Mason University organized the event, which was broadcast on NBC affiliates statewide. Libertarian candidate Cliff Hyra attended but did not participate in the debate. The race is the first major election in the year since President Donald Trump won office, and it is considered an early barometer of his presidency. Northam said he was willing to work with Trump on expanding shipbuilding and protecting Naval Station Norfolk, and to end sequestration. But he tried to link his opponent to several of Trump’s policies that Northam attacked, including the travel ban and the end of an Obama-era program that allowed immigrants who came to the United States illegally as children to stay and work. “Pulling away from the Paris accord … Ed supports that as well — very detrimental to Virginia,” he said. Gillespie has tried to sidestep Trump and run his own race. He told Republican voters, many of whom are still angry over the results of last November’s election, to look at his policies — all 17 of them are detailed on his website. And he pledged to serve all Virginians if elected. Here’s video of their opening statements from WTOP’s TV news partner, NBC Washington. Both men pledged to save Metro but neither is willing, at this point, to pony up more money for the ailing transit system. Neither would say whether they would take Maryland Gov. Larry Hogan up on his suggestion that all four jurisdictions — Maryland, Virginia, D.C. and the federal government — give the system an extra $500 million over the next four years to give leaders time to make systemic changes needed to improve governance, safety and reliability. Both said they are hoping that former Transportation Secretary Ray LaHood’s final report to Virginia Gov. Terry McAuliffe provides answers on a path forward. Although Northam said he won’t spend more money until the system’s challenges of safety and reliability are fixed, he said he would work with lawmakers in Richmond to make sure they understand how important Metro is, not just to Northern Virginia but to the whole state, comparing it to the Port of Virginia in Hampton Roads. Convincing state legislators — who have historically shied away from raising taxes to pay for transportation — to support new funding for Metro will be a major hurdle for Virginia’s next governor. Gillespie has attacked Northam for voting while in the Senate for a 2013 transportation package that increased the state sales tax, among other tax changes, and has pumped millions of new funding into state transportation programs. The law also gave Northern Virginia and Hampton Roads the ability to leverage some tax dollars for regional projects. Northam defended the state’s economy. He said since the McAuliffe administration took the helm, unemployment has dropped statewide to 3.8 percent. But Gillespie decried what he described as the state’s anemic economic growth that’s led to Virginians leaving to seek jobs elsewhere. He said Virginia must make it easier for existing small companies to grow and to stop focusing its economic development hopes on large employers, like Amazon, which is currently searching for the home of its new East Coast headquarters and bringing 50,000 jobs with it. Northam chastised Gillespie for painting such a dour portrait of the state’s economy. His economic plan focuses on expanding workforce training, modernizing public school curriculum to focus on science and technology, and to continue to build the state’s energy production – especially wind and solar power.